A legendary toy comes to the small screen for the first time in Charlie’s Colorforms City. The series, now streaming on Netflix, imagines the famous Colorforms logo icon as Charlie — a colorful character that leads kids on a series of shape-filled adventures. Based on the stick-and-peel Colorforms sets that first debuted in 1951, the series comes from 9 Story Media Group and creator Angela C. Santomero (Blue’s Clues, Daniel Tiger’s Neighborhood), who also serves as 9 Story’s chief creative officer. Development on Charlie’s Colorforms City began at Santomero’s Out of the Blue Enterprises, which was acquired by 9 Story Media Group last May and rebranded as 9 Story USA. Kahootz Toys has been the official toy partner for Colorforms over the past several years, releasing a mix of all-new products and retro play sets. This May, the company will release an all-new game, Colorforms Silly Faces. 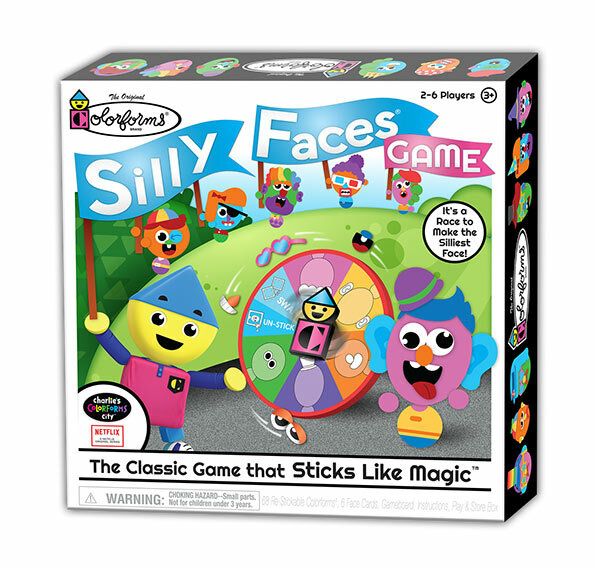 Designed for 2 to 6 players ages 3 and up, it’s a race to make the silliest face.